After seeing these at Winter NAMM 2018, I purchased a set to replace an 81/60 set in an ESP LTD Eclipse. Even though I am a huge fan of EMG bass pickups, I have never been a fan of EMG guitar pickups, as I feel they sound sterile and compressed. But in this case, I didnt want to rewire the whole guitar, so i gave the Retroactive Super 77s a shot. Boy am I glad i did! 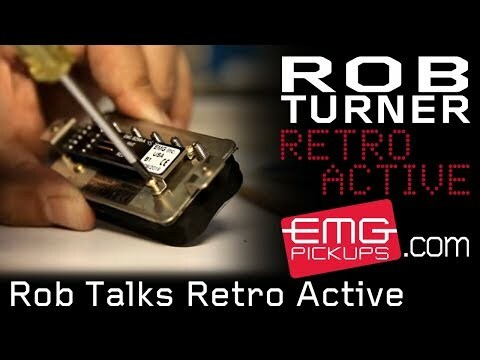 These pickups embody everything I love about passive pickups, with the added punch and clarity of an active system. They have the wide open tone, and very natural harmonics. And of course, they are super quiet. No hiss or hum from a high gain amp. I really love these pickups. 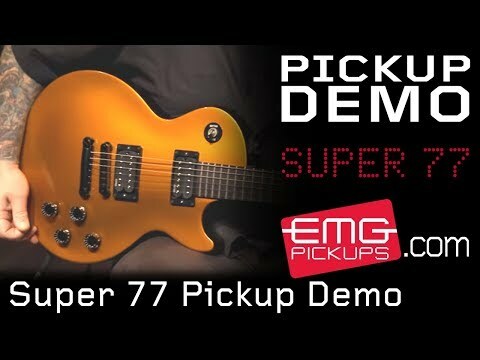 If you are a fan of that ceramic pickup hard rock or metal tone, the Super 77s are for you. I am going to try a set of alnico Retroactives for an even warmer more vintage tone next! Love these pickups! I play a baritone tuned to drop G in a two piece and I struggled finding passives that could handle the sonic output from the guitar. I wound up using an emg 81 for a while and it handled the low end better than anything uo to that point but I just never managed to dial in the right vibe from it. I took a punt on the super 77 and it was money well spent, it cleans up great but it’s got a real nastiness and attack to it, but the main thing which impressed me was the clarity, it made playing in drop G sound like e standard in terms of how tight the sound was. 10/10 from me. Can't believe it's active !!! Loaded these into a PRS Zach Meyer Single cut. The stock pickups weren't bad but seemed a bit muddy. Being a semi hollow i was sure it was a combination of the guitar design and pickups. It didn't alter the sound so much but rather, brightened, tightened. It also has a more open sound akin to a passive PAF and bumped up the mids. They act and feel like passive pickups. Very articulate. I can still decipher chord tones even in high gain territory. Cleans up well with guitar volume pot. Really a versatile pickup. You can cover a lot of ground with this set. From blues to Hard Rock, to 80's hair band and metal. Very easy install as well and I can swap out pickups very quickly. Really are a great set of pickups. You won't regret getting them. 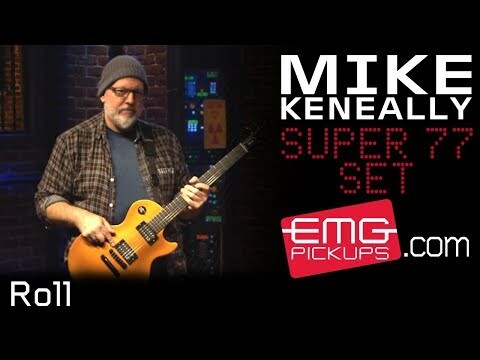 I also like many reviewers have multiple guitars with different pup combos with big name brands e.g. 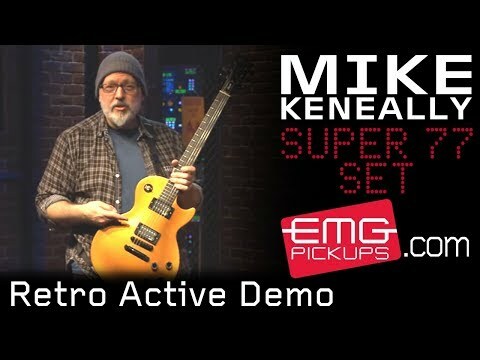 Seymour's, BK Pups, DiMarzio, and other EMG's active & passive. I actually like my BK Holy Diver and my H4 EMG and I thought I had great tone until I put these bad boys in. OMG these blow the doors off all my pups. Great clarity and awe inspiring articulation along with that wonderful "Brown Sound" from the hair bands. They do not sound or play active they're passive feeling but with more grit. They can do most any style clean to death metal but they shine best with blues & 70s/80s rock. Keep up the great innovations EMG. Now if I can afford to convert many of my other axes to carry a battery (including semi hollow es 335 types) I could load them all with 77's or 55's. Awesome product. Thx EMG. The Neck pup is very bubbly sounding to my ears I love it ! The Bridge pup is nice gritty just a tad to much highs for my taste but an adjustment to my amp EG sorta fix it... 1-10 I would grade them an 8.. This set is simply amazing! I put them on a LTD Eclipse and it gave whole new life to the guitar! I ran 'em through clean, blues runs, classic rock, heavy metal, death metal and even some djent tones and the P'ups responded!! Very nice and warm with a very nice top end! That Brown sound is right there by simply plugging these bad boys into a amp! I own the Tele set and the Gilmour set as well. EMG's man, I'm telling you, you can't go wrong! I definitely recommend these for the versatility they bring with them! Well, this set had us guys who love 70/80's hard rock in mind! They do not sound active to my ears, I've had the 81/85 set which is great for metal, hard rock, the 57/66 set which are very versatile, well rounded jack of all trades, master of none. As my music style changed to more instrumental (Andy Timmons, Paul Gilbert etc) and I've always been a "classic hard rock" Kiss, Sabbath, to the 80's Tesla, Dokken, Etc. This set is great, versatile, the volume knobs interact with the pickups and picking softly changes the dynamics. Great set, recommend to everyone! !